The add Draw option allows you to select a set of random questions from one or more of your pools and add them in your assessments. When you include ‘draws’ in your assessment, each student will receive a random set of questions from your pools. Random draws are also beneficial for practice skills tests and multiple tries. If you want students to practice learning some terminology, for example, random draws from large question pools will ensure that they get served different questions every time they take your practice quizzes. Additionally, if the assessment is set up so students can attempt multiple tries, they will not get the exact same random draw questions each time they take the assessment. How different each test will be with every try depends on the size of your pool. The larger your pools, the higher the randomization possible and choice of questions that can be drawn from to be presented to students. 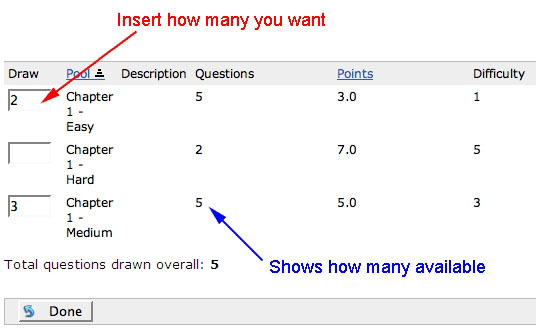 To add a draw detail to your assessment, click on the Draw link on the Edit Assessment page. All the pools in your course site are listed. To the right of the pool title, there is a column which shows how many questions are available in each pool. Other columns show how many points questions are worth and their difficulty. Note that you can sort by pool title and points. In the box to the left of the pool titles, add how many questions you’d like to draw from each pool. If you go over the number of questions that are available in the pool, you will get a warning that your selection is invalid. Click Done at the bottom of the page after making your choices. If you are assembling a “Test” with a random draw detail that is calling questions from a pool that has both assessment and survey questions in it, only the assessment questions will be listed in the add a draw component. Likewise, if you are creating a survey with a draw component that is calling questions from a mixed pool (assessment and survey questions), only the survey questions will be listed in the add draws screen.